When you buy MotorStorm RC you will be able to play it on PS3 and PS Vita at no additional cost. When you buy Hustle Kings and/or Top Darts for PS Vita, you will get the PS3 versions for free. If you already own these games on PS3, you’ll be able to download the PS Vita version for free. If you purchase WipEout 2048 and you already own WipEout HD and the HD Fury DLC on PS3, you will be able to download them for free when they launch on PS Vita later this spring. DLC purchased for the PS3 version of Ultimate Marvel vs. Capcom 3 can be used on the PS Vita version for free (and vice versa). 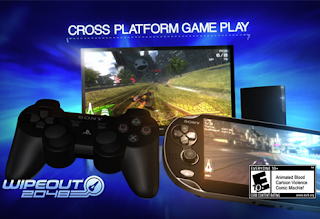 As we’ve noted previously, WipEout 2048 owners on PS Vita will be able to race against WipEout HD owners on PS3 across four tracks beginning at launch, which is separate from this promotional pricing. Hustle Kings also offers turn-based multiplayer pool between PS Vita and PS3 at launch. And Ultimate Marvel vs. Capcom 3 offers the “Ultimate Controller,” an exclusive configuration in which you can use PS Vita as a controller to play the PS3 version of the game, complete with touchscreen special move selection. All of this cross-play functionality is among the unique, new ways to play that we are ushering in with PS Vita. Let us know what you think about Cross Play in the comments below!